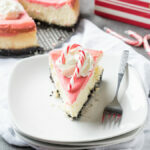 A rich and creamy dessert with that sweet candy cane flavor is this White Chocolate Peppermint Cheesecake! 1 cup white chocolate morsels, melted and cooled slightly. Preheat oven to 350 degrees F. Place a 9″x13″ pan on the bottom rack of your oven and fill half way with water. Position a rack just above the pan, in the middle of the oven. To make the crust, use a food processor to chop up the 20 Oreo cookies until they turn to a fine crumb, drizzle in the melted butter and pulse until combined. Optionally, you can use your hands or a rolling pin to crush the cookies. Press the crumbs in a 10″ spring form pan in an even layer, and a little up the sides of the pan. Bake for 5 minutes, then remove from oven, set aside. In the bowl of your stand mixer, fitted with the paddle attachment, beat the cream cheese until smooth. Add the greek yogurt, white chocolate, sugar and vanilla and beat until combined, scraping down the sides of bowl when necessary. Add the eggs one at a time, beating in between. Scoop out a cup of the cheesecake mixture and place in a separate bowl, then pour the remaining cheesecake over the crust. To the small bowl add the peppermint extract (or peppermint oil) and red food coloring, stir until combined. Add more food coloring if desired. Spoon the mixture over the top of the cheesecake into an even layer. Carefully place in the oven and bake for 70 to 75 minutes, or until the center of the cheesecake is only slightly jiggly. Add the heavy cream and 2 to 3 drops of peppermint oil to a bowl and beat with the whisk attachment until light and fluffy. Sweeten with the powdered sugar and beat until combined. Serve the whip cream on top of the cheesecake with a candy cane on top. I like to keep the spring form pan around the cheesecake whenever I’m not serving it, this will help protect it, and makes it easy to cover while in the fridge. *If your cheesecake cracks on top when cooling, check out this post for an easy fix!